Every site you or somebody or even something, like spyware, opened in your browser, with all images, and all downloaded any maybe later removed movies or mp3 songs- ARE STILL THERE and could broke your life! REMOVE ALL SPYWARE FROM YOUR PC! Apart from this my system tray is showin on red X mark displaying message repeteadly "your computer is infected. Protect your computer from viruses". If anyone help this regard I will be appreciable. Hi ram_hyd and welcome to the Geeks to Go Forums.
. In the left hand column, click "View Topics"
3. Download the following program HOSTER. Unzip and run the program. You will be presented with a screen where you will find the following option:Restore Microsoft Original Hosts. Press it and Close the program. 4. Please download Winhelp2002's Deldomains.inf to your desktop. Once it is finished your Zones should be reset. 5. Please follow the instructions provided, you may want to print out these instructions and use them as a reference. Please download ewido security suite it is a trial version of the program. Thankyou for your support. I did all the instructions as you explained. But there is no change in my desktop. You plz find the HJT Log and ewido scan log here. I probably should have told you that you wouldn't see any change at the beginning. We have to get rid of a lot of junk first. This next step is the start of the work on your desktop. This procedure works a lot of the time. If it doesn't, we have alternate means of eradicating this malware. 1. Run HijackThis. Click on "Config...", "Misc Tools", "Open process manager". Select the following files and click on "Kill process". Answer Yes to the "Are you sure..." question. 2. Launch Wordpad, and copy/paste the box below into a new text file. Save it as fixme.reg and save it on your Desktop. 3. Locate fixme.reg on your Desktop and double-click on it. You will receive a prompt similar to: "Do you wish to merge the information into the registry?". Answer "Yes" and wait for a message to appear similar to "Merged Successfully". 5. Launch Wordpad, and copy/paste the box below into a new text file. Save it as Unreg.bat and save it on your Desktop. Locate Unreg.bat on your Desktop and double-click on it. 8. Run HJT, click SCAN, produce a LOG and Post it into this thread for review. I am very thankful for your kind support. "Cannot import C:\DOCUME~1\MEGHAV~1\Desktop\fixme.reg: The specified file is not a registry script. You can only import binary registry files from within the registr editor." Save the file as fixme.reg (name) and in "type of files" (Box underneath) choose "All Files"
Please print out or copy this page to Notepad. Make sure to work through the fixes in the exact order in which they are mentioned below. If there's anything that you don't understand, ask your question(s) before proceeding with the fixes. *choose to "show hidden files and folders,"
*uncheck the "hide protected operating system files" and the "hide extensions for know file types" boxes. 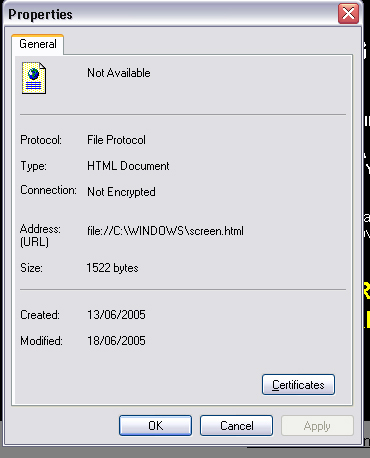 Close all browser windows and RUN HijackThis.
. Click the SCAN button to produce a log. *as soon as BIOS is loaded begin tapping the F8 key until the Advanced Options menu appears. Finally, RUN Hijackthis again and produce a new HJT log. Post it in the forum so we can check how everytjhing looks now. Same problem with the desktop again.. Plz check for the log file below and suggest remedies. OK, here is the plan, I have to disinfect all your PC, THEN do the desktop. I am hoping that this will be the last with the bad stuff. 2. Open the zip file and extract the regfile to your desktop. 3. Double click Fix_Protocol_zones_ranges.reg and allow it to merge with the registry. Now click Fix checked and EXIT the program. 9. Finally, run HijackThis, click SCAN, produce a LOG and POST it in this thread for review. NOTE: Now also provide a detailed description again of all the problems with your desktop. Plz check the HJT log file and also you plz find attachments which shows my desktop snapshots i.e., desktop.jpg and when we right click + properties it is showing a box you plz find the snap shot in desktop1.jpg. Somthing like screen.html was replaced. 2. If you have done this correctly, the file will look like a blue cube on your desktop. 3. Doubleclick desktop.reg and when the program ask you permission to merge,, answer YES. 5. Finally, run HijackThis, click SCAN, produce a LOG and POST it in this thread for review. If not right, any differences from before? Please find the HJT Log file and the desktop remains same.